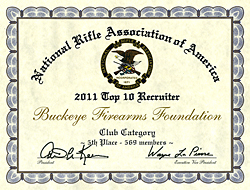 The National Rifle Association has announced that Buckeye Firearms Foundation is among the top 10 NRA membership recruiters in the "club" category with 569 members to its credit for 2011. The recruitment program is set up to grow membership for the NRA while providing financial support for grassroots efforts. For each person who enrolls or renews, the Foundation receives a small portion of the proceeds to use for pro-gun activism in Ohio. New members are enrolled at gun shows and through special links on this website. When you join, renew, or give a membership as a gift through Buckeye Firearms Foundation, you get $10 off your annual membership automatically. CLICK HERE to join the NRA now.